Terry Doherty receiving the perpetual Godolphin Trophy from special guest presenter Freddy Tylicki. In a poignant moment, Terry was awarded with the perpetual Godolphin Trophy by special guest presenter Freddy Tylicki alongside presenter Ed Chamberlin and Stobart Champion Jump Jockey Richard Johnson at an event hosted by the British Horseracing Authority (BHA). He was also presented with a cheque for the total of a staggering £40,000, of which £20,000 will be shared amongst the staff at the Watership Down Stud, part of £120,000 in prize money which was awarded on the evening by sponsors Godolphin. 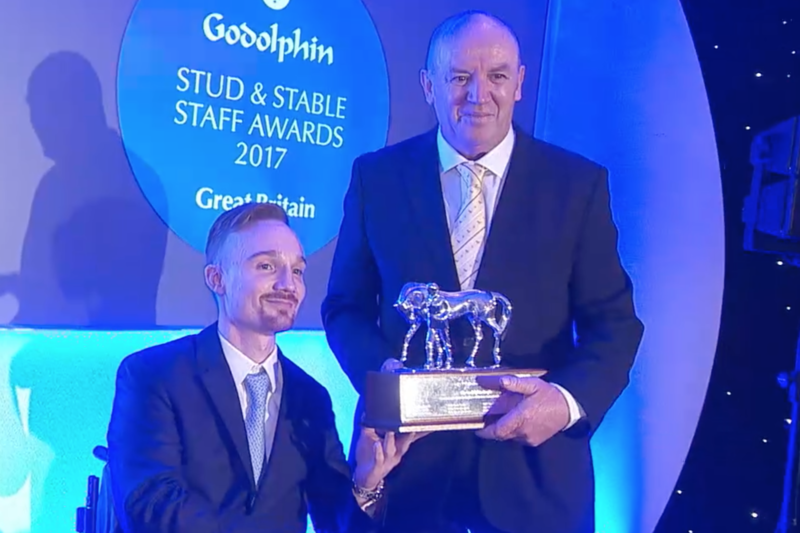 Terry has been Stud Manager of Watership Down for 24 years and was earlier in the evening presented the prize as winner of the Stud Staff Award. When he arrived in 1992, bringing with him a wealth of experience, the Stud had no name, no horses and no post and rails. Terry’s professionalism, integrity and dedication has helped shape what the Stud has become today. Terry has helped develop the prestigious broodmare band, has never missed a foaling, personally feeds each horse and leads the dedicated team from the front. What he has given to Watership Down, the Lloyd Webbers, their horses and thoroughbred breeding, both on the track and in the sales ring, is exceptional. The Awards ceremony took place at the Jumeirah Carlton Tower Hotel in London’s Knightsbridge in front of a specially invited audience from across the racing industry to celebrate the vital role of stud and stable staff in the racing industry and the care which they provide to the horses they look after. The winners of the Awards were decided at a formal judging day at the BHA’s London office in the morning before the ceremony, where the finalists were interviewed by members of the judging panel. The other category winners on the night were: Elisha Whittington from Tom Dascombe’s Manor House Stables who took the David Nicholson newcomer award; Brian Meehan’s assistant trainer Rory O’Dowd who took the Leadership award; Jamie Bunsell of Paul Henderson racing who was successful in the Rider/Groom category; and Head Lad to Sir Mark Prescott Colin Nutter whose 45 years caring for horses at Heath House earned him the Dedication to Racing award. Also honoured was Sarah Monkman whose work raising the profile of Racing Welfare saw her land the Rory MacDonald Community award, which is in just its second year. The winners of the Leadership, Rider Groom, Stud Staff and Dedication to Racing categories received a prize of £5,000 with an additional £5,000 also being awarded to the winner’s yard or stud. The two runners-up in these categories won £2,000 each, with the same amount going to their yard or stud. The winner of the Rory MacDonald Community Award received a prize of £5,000 with an additional prize of £5,000 going to the charity of their choice. The two runners-up won £2,000 each with the same amount going to their charity of choice. The winner of the David Nicholson Newcomer Award received £2,000, with the same amount going to their yard or stud, while two runners-up received £1,000 each, with the same amount for their yard. She also wins a five-day educational trip to Dubai to learn more about the country’s racing, culture and customs. The prize includes a return flight and five nights’ accommodation at the Jumeirah Beach Hotel’s five-star resort. The Employee of the Year received an additional £15,000, with the same amount awarded to their yard or stud.